Giovanni Boccaccio (June 16, 1313 – December 21, 1375) was an Italian author and poet, a friend and correspondent of Petrarch, an important Renaissance humanist in his own right and author of a number of notable works, including On Famous Women, the Decameron and his poems in the vernacular. Boccaccio's characters are notable for their era in that they are realistic, spirited and clever individuals who are grounded in reality, in sharp contrast to the characters of many of his contemporaries, who were generally emblematic of Medieval virtues like chivalry, piety and humility. Through this emphasis of realism over outdated scholasticism, Boccaccio helped to found the Renaissance movement of humanism. Boccaccio's poetry would be some of the most widely influential in any language—writers ranging from Chaucer and Shakespeare to Montaigne and Goethe would directly borrow material and techniques from him. In this way, he is one of the seminal influences for both Renaissance art and philosophy. Like his Florentine contemporaries Dante and Petrarch, Boccaccio continues to be one of the most important figures in Italian literature. The exact details of his birth are uncertain. But what is certain is that he was the illegitimate son of a Tuscan banker and an unknown Frenchwoman. An early biographer claimed his mother was a Parisien and that the city was also the place of his birth, but this has been largely devalued as a romanticism and his place of birth is more likely to have been in Tuscany, perhaps in Certaldo, the town of his father. Boccaccio grew up in Florence. His father worked for the Compagnia dei Bardi and in the 1320s he married Margherita del Mardoli, a member of an illustrious family. It is believed Boccaccio was tutored by Giovanni Mazzuoli and received from him an early introduction to the works of Dante. Around 1327 Boccaccio moved to Naples when his father was appointed to head the Neapolitan branch of his bank. Boccaccio was apprenticed to the bank and spent six years there. It was a trade for which he had no affinity and he eventually persuaded his father to let him study law at the Studium in the city. Boccaccio enjoyed law no more than banking, but his studies allowed him the opportunity to travel widely and make contacts with fellow scholars. His early influences included Paolo da Perugia (a curator and author of a collection of myths, the Collectiones), the humanists Barbato da Sulmona and Giovanni Barrili, and the theologian Dionigi da San Sepolcro. In the 1330s Boccaccio also became a father to two illegitimate children, Mario and Giulio. In Naples Boccaccio began what he considered his true vocation, poetry. Works produced in this period include Filostrato (the source for Chaucer's Troilus and Criseyde), Teseida, Filocolo — a prose version of an existing French romance, and La caccia di Diana, a poem in octave rhyme on Neopolitan women. During this time Boccaccio produced a considerable number of formal innovations, most importantly the hendecasyllable stanza form ottava rima, which would become one of the most popular strophes in Italian poetry for centuries afterwards. The ottava rima, an eight-line octave consisting of alternating couplets, would later influence Petrarch and find its way into his tremendously influential form, the sonnet, which consists of an octave followed by a contrasting sestet. Boccaccio returned to Florence in early 1341, avoiding the plague in that city of 1340 but also missing the visit of Petrarch to Naples in 1341. He left Naples due to tensions between the Angevin king and Florence. Boccaccio's notorious bad luck would strike as soon as he arrived. His father went bankrupt, and a little later, his mother died. Although distressed, Boccaccio continued to work, producing Comedia delle ninfe fiorentine (also known as Ameto) a mix of prose and poems in 1341, as well as the fifty canto allegorical poem Amorosa visione in 1342 and Fiammetta in 1343. The pastoral piece Ninfale fiesolano probably dates from this time. In Florence the overthrow of Walter of Brienne brought about the government popolo minuto. It diminished the influence of the nobility and the wealthier merchant classes and assisted in the relative decline of Florence. The city was further hurt in 1348 by the Black Death, later used in the Decameron, which killed maybe three-quarters of the city's population. From 1347 Boccaccio spent a lot of time in Ravenna, seeking new patronage, and despite his claims it is not certain he was actually present in plague-ravaged Florence. His stepmother died during the epidemic and his father, as Minister of Supply in the city, was closely associated with the government efforts. His father died in 1349 and as head of the family, Boccaccio was forced into a more active role. During a very difficult time Boccaccio began work on the Decameron around 1349. It would easily be the most influential work of his life, and one of the most important touchstones in European literature. It is probable that the structure of many of the tales dates from earlier in his career, but the choice of a hundred tales and the frame-story lieta brigata dates from this time. The work was largely complete by 1352 and it was Boccaccio's final effort in literature and one of his last works in Italian. Boccaccio revised and rewrote the Decameron in 1370-1371. The poem tells the story of the flight of twn people (seven women and three men) from the plague-stricken Florence of 1348. They travel to a peaceful country home, where over the course of a fortnight each member of the party takes a turn being king or queen over the others. Each party member, during their turn, directs what they shall do for the day, where they shall go, what they shall discuss, and above all, what songs and stories they will share. The storytelling takes place over the course of ten days; with the rest of the fortnight set aside for personal avocations and religious devotions, hence the title of the work, Decameron, or "Ten Days' Work." Each of the ten days concludes with a canzone (song) sung by the leading party member; these songs consist of some of Boccaccio's most lyrical poetry, and indeed, some of the most lyrical poetry in the Italian language. During the course of the work, over one hundred stories are told, all of which are mediated by a master theme; namely, the life of an educated and utopian upper class who could balance between the conventions of their time and open-mindedness for new ideas. The poem begins with somber opening passages in which the plague and the moral chaos of Florence are described in vivid detail. This is in sharp contrast to the scintillating liveliness of Day I, which is spent almost entirely in witty disputes, leading into the playful atmosphere of intrigue that characterizes the tales of adventure or deception related on Days II and III. With Day IV and its stories of unhappy love, the gloomy returns; but Day V brings some relief by giving happy endings to stories of love that do not at first run smoothly, though it does not entirely dissipate the echo of solemnity. Day VI reintroduces the gaiety of Day I and constitutes the overture to the great comic score—Days VII, VIII, and IX—which are given over to laughter, trickery, and license. Finally, in Day X, all the themes of the preceding days are brought together in a grand comic crescendo, where the impure is made pure and the common made heroic. The poem is particularly admired for its masterfully allusive and classical verse in the prefaces to the individual stories. Yet there is another side to Boccaccio's genius: like fellow seminal poets Chaucer of England and Pushkin of Russia, Boccaccio was a master of the many dialects of common speech in his time, and he integrates them all into a rich symphony of voices. Boccaccio was a skilled storyteller, and when necessary he freely dropped the ornamentation of his more classical passages for swift and direct narration in ordinary language. The poem is considered a point of departure in medieval literature; more than one critic has labeled it the "Human Comedy," in contrast to Dante's Divine Comedy in that, unlike the medieval poets that had come before him, Boccaccio was concerned with the details of everyday people and everyday life, rather than with the obscure and mystical rites of the medieval, Catholic divinity. In this sense, Boccaccio became one of the forerunners of humanist aesthetic focusing on the experiences and travails really faced by men. While the Decameron is essentially medieval in subject matter (borrowing the long popular form of a courtly comedy of manners) the spirit is entirely new. For the first time in European literature, the stories of the Decameron depict characters encountering fate and overcoming in, in direct contrast to the fatalistic classical drama predominant since Seneca. According to the Decameron, man must wrestle with fate, but also ultimately learn to accept what is beyond his control without bitterness and, above all, accept the consequences of wrong action. To achieve happiness, the characters of the Decameron confine themselves to trying to achieve realistic goals, and not chase after dreams that are not humanly possible. From 1350 on, Boccaccio became an emissary of the Florentine government and the Italian humanism it supported. His first official mission was to Romagna in late 1350, he revisited that region twice and was also sent to Brandenburg, Milan and Avignon. He also pushed for the study of Greek, housing Barlaam of Calabria and encouraging his tentative translations of works by Homer, Euripides and Aristotle. In October 1350 he was delegated to greet Petrarch as he entered Florence and also have the great man as a guest at his home during his stay. The meeting between the two was extremely fruitful and they became friends from then on, Boccaccio calling Petrarch his teacher and magister. They met again in Padua in 1351, when Boccaccio came on an official mission to invite Petrarch to take a chair at the university in Florence. Although unsuccessful, the discussions between the two were instrumental in Boccaccio writing Genealogia deorum gentilium ("On the Genealogy of the Gods"). The first edition was completed in 1360 and it would remain one of the key reference works on classical mythology for over 400 years. The discussions also formalized Boccaccio's poetic ideas. Certain sources also see a conversion of Boccaccio by Petrarch, from the open humanist of the Decameron to a more ascetic style, closer to the dominant fourteenth century ethos. 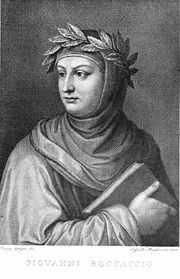 After his meeting with Petrarch, Boccaccio almost never wrote in Italian again, preferring to imitate the former's deeply allusive and archaic Latin poetry. He also turned from his earlier admiration of Dante's vernacular poetry towards the much older Latin works of Virgil, Ovid and, above all, Tacitus. Following the failed coup of 1361, a number of Boccaccio's close friends and other acquaintances were executed or exiled in the subsequent purge. Although not directly linked to the conspiracy it was in this year that Boccaccio left Florence to reside in Certaldo, and also was more distant from government affairs. He did not undertake further missions for Florence until 1365, when he traveled to Naples and then on to Padua and Venice, meeting up with Petrarch in grand style before returning to Certaldo. He met Petrarch only once more, in Padua in 1368. On hearing of the death of Petrarch (on July 19, 1374) Boccaccio wrote a commemorative poem, one of his last in Italian, and included it in his collection of lyric poems, the Rime. He returned to work for the Florentine government in 1365, undertaking a mission to Pope Urban V. When the papacy returned to Rome in 1367 Boccaccio was again sent to Pope Urban, offering congratulations. He also undertook diplomatic missions to Venice and Naples. Of his later works the moralistic biographies gathered as De casibus virorum illustrium (1355-1374) and De mulieribus claris (1361-1375) were most significant. Other works include a dictionary of geographical allusions in classical literature, De montibus, silvis, fontibus, lacubus, fluminibus, stagnis seu paludibus et de nominibus maris liber (a title desperate for the coining of the word "geography"). He gave a series of lectures on Dante at the Santo Stefano church in 1373, which resulted in his final major work, the detailed Eposizioni sopra la Commedia di Dante. His final years were troubled by illnesses, many relating to his great obesity. He died in Certaldo, Tuscany, on December 21, 1375. Alphabetical listing of selected works. For a comprehensive listing, see Giovanni Boccaccio: an Annotated Bibliography (1992) by Joseph P. Consoli. Decameron Web A project of the Department of Italian Studies at Brown University, this site has much of Boccaccio's writing both in the original Italian and in English translation. This page was last modified on 17 December 2016, at 22:30.